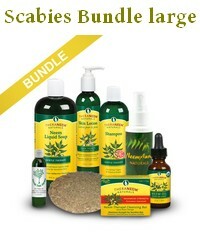 Scabies is a highly contagious and extremely irritating skin condition caused by a mite infestation. Because the mites live under the skin they are hard to get to and hard to kill. So the substance used to kill the scabies mites has to penetrate your skin. In other words, it enters your body. In some cases a doctor may even prescribe systemic treatment, meaning you will get medication to swallow to kill the mites from the inside. Any prescription treatment for scabies is harsh on your skin and body, period. It can do more harm than good. Permethrin, a pesticide and the most common scabies treatment, is a known skin irritant. It's true that permethrin is poorly absorbed through healthy skin, but people with scabies symptoms have broken skin and lesions, so the protective barrier of the skin is compromised. Because of the allergy to the scabies mite (the allergy is the main reason for the symptoms of scabies) the skin is already oversensitive, the immune system is in overdrive, and an immune response like dermatitis is more likely. A skin reaction to permethrin may be uncommon in people with healthy skin, but it's not uncommon among scabies sufferers. Ivermectin is another popular scabies medication. Common side effects of ivermectin include red eyes, dry skin, and burning skin. Just what you want in a scabies treatment. Not! Also, the scabies mite is already resistent to many pesticides, but not to neem treatment. 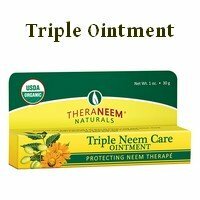 So natural treatment of scabies with neem is particularly useful for persistent cases, where other scabies treatments have failed. 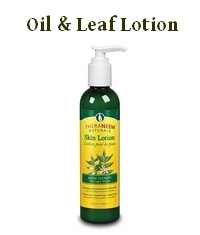 On top of that neem is actually used as and recommended for skin care, especially for irritated and inflamed skin. The instant relief from symptoms that a lot of people report is due to the anti-inflammatory, antibacterial and analgesic action of neem. (You can read more about that on the pages about neem and psoriasis or neem and eczema.) Neem is good for your skin! 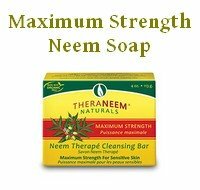 Neem not only kills scabies mites, soothes and heals your skin, it is also good for your immune system which plays an important part in fighting a scabies infestation. The most persistent cases of scabies are often due to a compromised immune system. Neem and Scabies: overview and introduction. Scabies and Neem: the research results. Using Neem Oil for Scabies: can you use neem oil for the treatment of scabies? 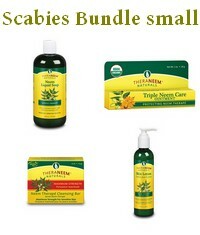 Neem Home Remedies for Scabies: how to treat scabies at home.